I originally came up with the recipe for these creamy Greek chicken pita sandwiches when I was trying to use up all the fresh veggies I had in my fridge. I wanted a quick lunch that was savory, creamy, and fresh. 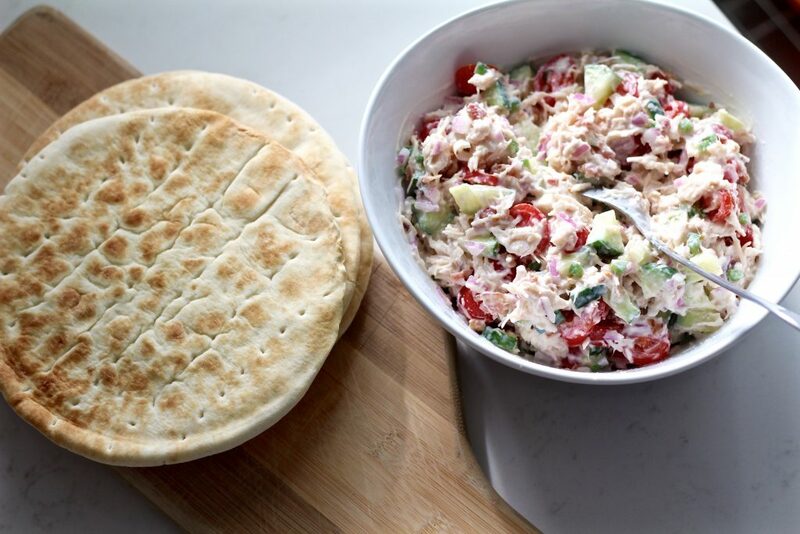 I loved how this greek chicken salad turned out! 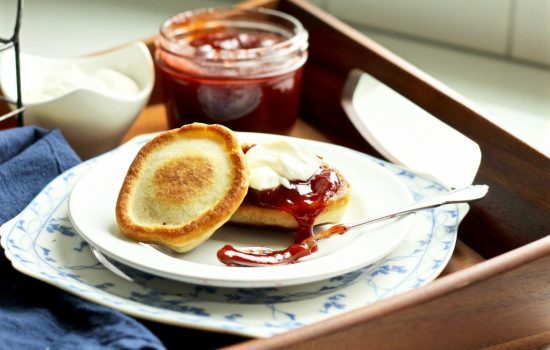 Sandwiching it between the warm pita bread made it even better. (I always keep a big pack of pita bread from Costco in my freezer. 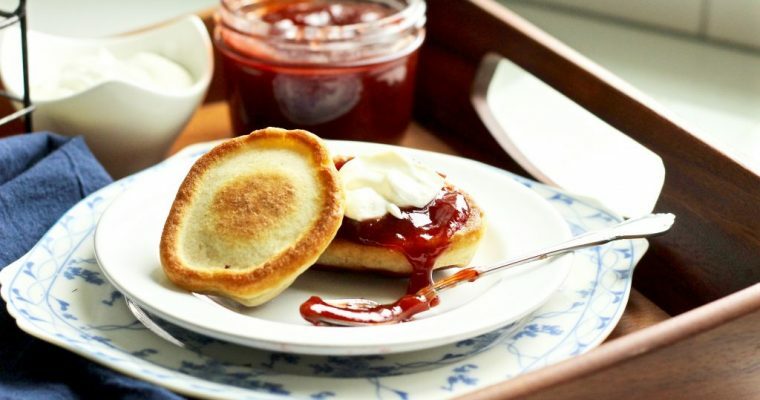 It takes only 30 seconds in the microwave to defrost one flatbread and is always available on demand this way!) 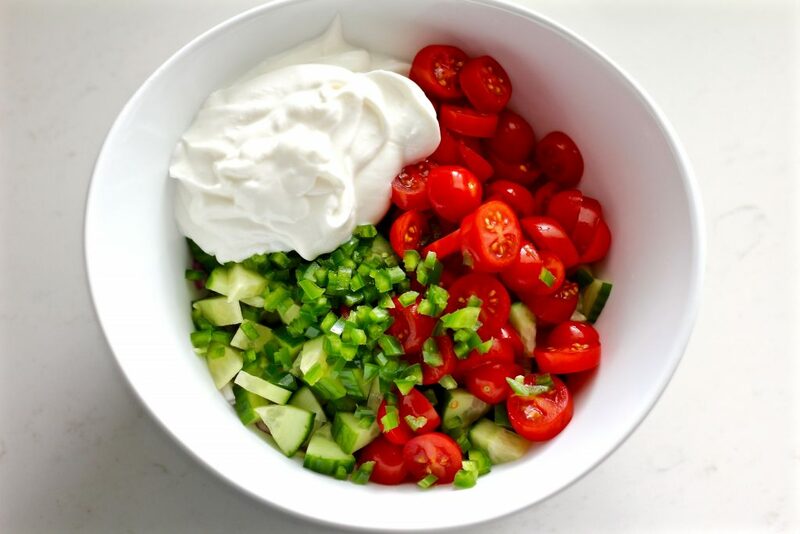 Cucumbers, cherry tomatoes, red onions, jalapeños, and lemon juice add the perfect amount of fresh crunch and flavor. 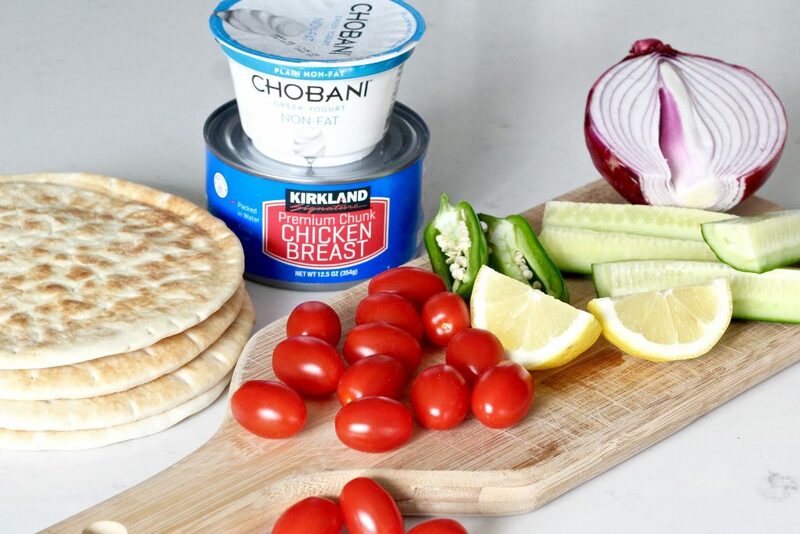 The tender canned chicken breast and bacon bits add the savory element and the fat free greek yogurt brings all the flavors together! Are you as obsessed with chicken salad as much I am? Try my go-to favorite 10-minute chicken salad croissants!! Cut up the cucumbers and tomatoes and add to the bowl. Remove the ribs and seeds from the jalapeño, dice finely, and add to the bowl. Add 1 5oz container of fat free greek yogurt and mix it all together. Drain a 12.5 oz can of chicken and add it to the veggie/greek yogurt mixture. Add 1/4 real bacon bits, and mix it all together once again making sure to break up the larger chunks of chicken. Add salt to taste if desired and mix again. 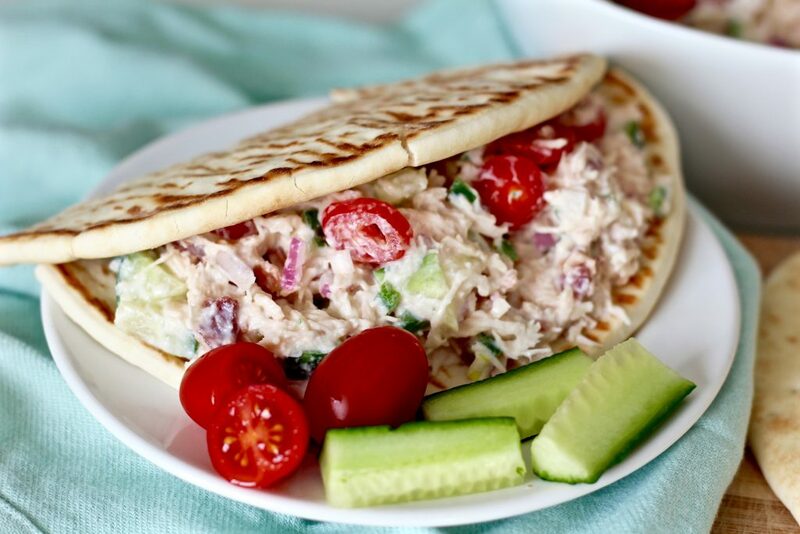 Warm up pita bread for about 30 seconds in the microwave, cut rounds in half, then scoop even amounts of chicken salad mixture to make 4 entree-sized sandwiches. 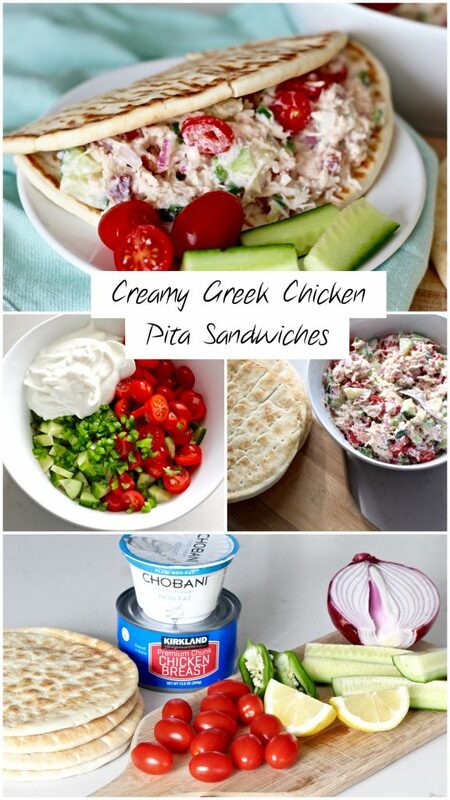 Enjoy these creamy Greek chicken pita sandwiches as a meal or cut in half for a fun, fresh appetizer! 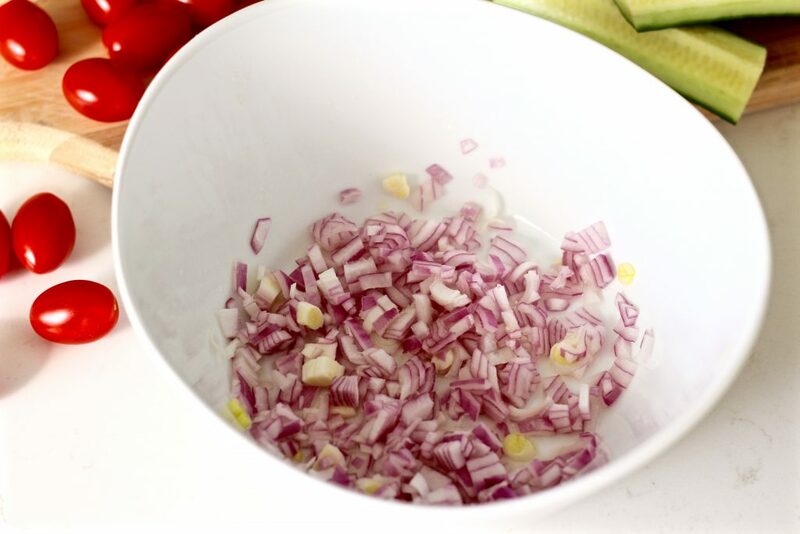 Begin by finely dicing the red onion. 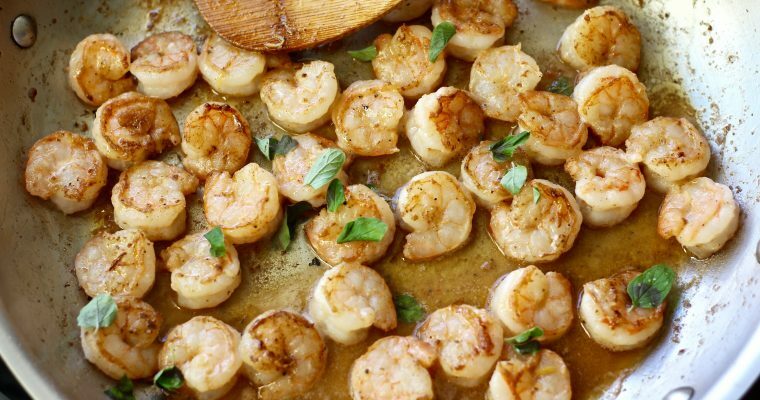 Add the onion to a medium sized bowl and cover with juice of 1/2 a lemon. 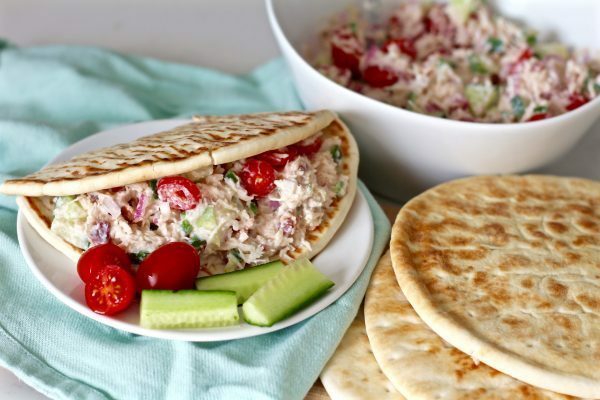 Warm up pita bread for about 30 seconds in the microwave, cut rounds in half, then scoop even amounts of chicken salad mixture to make 4 entree-sized sandwiches.